Sift was an email app design challenge for an Advanced Visual Design class. My partner and I wanted to simplify the inbox and have a quick way to organize incoming message. The user can categorize people by their closeness in relationships. With a simple shake gesture of the phone, the app "sifts" all of your important emails to the top. 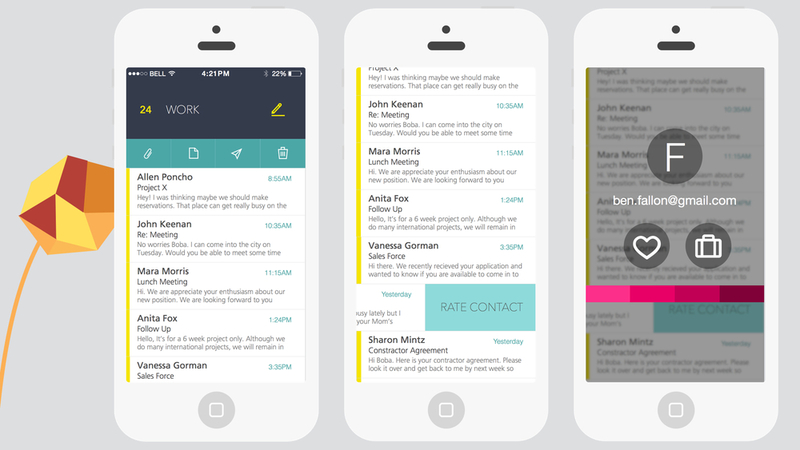 Design a mobile mail application that feels meaningful and guided. Explore metaphors for organizing and experiencing messages and develop a visual system for managing the chaos of email everyday. We chose the idea of shifting to quickly find the gems of your relationships in a crowded inbox. Sorting email all in one place based on when it was sent is cumbersome and time consuming: Help users organize and experience mail based around user-generated themes and/or people. Daily deals, social notifications, and retail newsletters are some of the most difficult email content to deal with: Help users manage and experience this content separate from their “important” email. Photos and attachments are generally hard to find unless you remember what they were attached to or who sent them: Help users view and search attachments and photos visually. Handle the basics: Manage multiple email accounts, compose and send email. Much of our email is based on relationships. Like the layers of an onion, the ones closest to the core are the most important. Unfortunately those people can quickly get buried with the clutter of outside life. We started with generating ideas on things we organize, and what we may organize them with. After mapping out the general architecture of most email applications, we started to play with our concept of "sifting" and the how that interaction could be played through out the design.